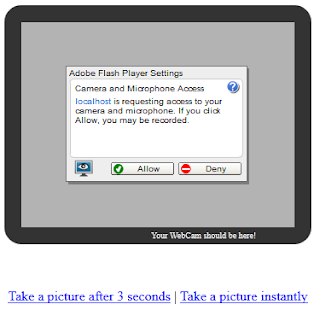 I keep getting questions about how we can use web camera inside jsp files , in this post i will show you how to use the web cam from within jsp file. We will use jQuery wrapper of flash plugin for that..
//Now you have the image bytes ready to save in File/DB/....etc.. If you are doing a video chat application you need to capture the images in periodic manner and upload it , you may include the source & destination ids to distribute the chat images correctly.. This code only works with integrated camera in the laptop not with USB external camera. These are simplified steps so you can copy and paste and let it work easily. But in case you need more details , you may refer to the original URL for more clarification on how to control it more.. I need your help sir. I have followed your tips above, but I still confuse to make UploadServlet. In what format UploadServlet is made, in PHP format or other format. I'm waiting for your respond thank you. Complete code is posted , this is a Java servlet, but you can still do it in any other language , just you need to get the 2 request parameters and process them. could you please post what need to do with USB web cam with a desktop pc? check standalone interactive4j for that. These information is extremely superb and very much useful. I will sure try to make use web cam from within jsp file. Keep on posting such wonderful information. I think the js files is not longer available into that page you mentioned before. Please, I would need jquery.js and jquery-1.js files... where can I found it? Send me your email to send you both files. i need files jquery.js and jquery-1.js please...or where can I get it? Send me your email to email to you these files, but you can even use higher versions if you want .. I have tried above code, downloaded the resources folder file for which you had given the link , but the problem is jquery-1.js is not available on the site which u mentioned and result is webcam is not on webpage, its just showing "Your webcam is visible here"
I have tried your code all works good except i see no web camera but a black area which says your webcam should be here. Thank you ! try another browser like IE. sir can you give me this code . i also need this one in my project . I can able to load the webcam in my browser, but i have a problem in taking the snapshot. P.S looking forward to hear from you soon. Hi! I'm trying to find the .js files required for the codes to work. Couldn't find them at the given link. Do you mind sending me those files? Greatly appreciate it! Yes send me your email to forward to you. What is the issue ? you can send me the issue or your project to analyze ..
Can you send me your email so I can suggest you what to do..
Or I can use the latest version of jQuery??? Either try the latest or send me your email to send across.. I use latest jquery file (jquery-2.0.3.js) but till now, its not working... send me both files man. my id is "xshailendra@gmail.com"
Hello, thanks for the demo, but still can't find the js files on the web , would please send them to me ??? "achrafelouahdi@gmail.com"
Please mail me the jquery-1.js file.My email ID is akhilesh.taurus@gmail.com. When I run the jsp file,the camera does not initialize in the browser window and it just displays "Your webcam should be visible here! ".Please reply ASAP. Please send js files to me. "shahmar92@gmail.com"
Send me your email .. I want to access the webcam from a java servlet. I had read all your article. It's superb. But the problem is I am not able to find the two .js files i.e the jquery.js and jquery-1.js. If you can please tell me where would I find it. Send me your email to send them across. im having a lil problem with my application, cause im trying to send the data by post method to my Servlet, but doesnt work, nothing happenning when jquery active the post method, im using richfaces in my project, so i cant use the files that you said, but the cam is working fine, only not sending to my servlet, that files influence in post method? u have any idea how to solve my problem? pls help me! What is the issue in upload servlet? can you explain so i can help you ? I need to see the output. I copied the code of jsp and servlet exactly what you have given. I do not have the required js files. I want to run the web project now. Share with me please.sharing code will be fine.I tried to run the project with jquery.webcam plugin but its not showing the camera. I am having a program named as visitor management system, now my requirement to capture the photo by "logitec" webcam by jsp and show in the jsp it self (there should be two image box first for image capturing and showing image after capturing). that means capturing should be done by jsp and shown in jsp it self then store in database after accept. Please give me solution how to do it? my mail id is "abhishek1986.1986@gmail.com"
In my previous question .I was missing webcam plugin . So, i have added the plugin. It's successfully connected to my webcam .But i am getting another js error changeFilter() not defined. Can u plz explain me? Hi Osama , can email me the js files ? greatly appreciated "hcwong"
Please send the required js files. i have tried it and it run properly in Morzila but not in IE 8 and Chrome 32.0.1700.107 version. it's detecting webcam but not showing image. Hi Could you please share the required js files or host it on the site, available to copy or download. My email id is meetmanojit@gmail.com. Please send me all the .js files as I'm not able to retrieve them from link you provided. I am trying to capture image from webcam of a client and save it on the server.So, can u please provide me with a way to do so and also please send me all the .js files. send me ur email, also follow the instructions above to do what u want. Where do we need to create the java file for servlet? Generally we create the servlets inside /WEB-INF/src, so is it the required folder where we have to create our servlet? Sorry , in any IDE you just need to create Servlet in any source package and the compiler will place it in the correct location. Can please you send me jquery.js and jquery-1.js file to my email alex_pato77@hotmail.com. if not, can you help me to display the picture that we save in jsp page? Hi Osama can you send me jquery.js and jquery-1.js to my email alex_pato77@hotmail.com. Please send me all the .js file i am in middle of a project. i try you code.. and stuck at jquery.js and jquery1.js ..
Only one message is coming i.e Your WebCam should be here. please send me all js file. Can you clarify what is the issue with the String format ? When i tried in IE 11 it is working fine, I don't have IE 8 to identify the issue. I am try to get you above code working. But I having aproblem to find this file in your download. Please can you email this file. JS files sent to you. Thanks for help I successfully implemented all the steps and its working fine for me. But my requirement is slight different. As we are using flash player for showing video by webcam, but my requirement is to stream the live video to media server using RTMP, so can you suggest me any solution or reference, link which will be helpful to me to stream video. Sorry I can't help on this ..
Ok Thank You for response. Please can you email this file. i would like to know if the code will work for live streaming over a webpage to be accessed over a phone with a html5 compatible browser without plugin. I don't think this is possible as it uses flash plugin. You can add stop button that direct the user to another page. my email address is minhson.nguyen6393@gmail.com. Thank you! can you please guide me.please send me all js file. Your WebCam should be here! Check on another browser like IE ? can you please guide me.I am getting error in servlet program also. i.e for static method used in it. which package should i import? Most probably the dependency files are not working well, can you re-examine your code again and compare it with the blog steps. Also try to test it in different browsers. Could you please share the two js (jquery.js,jquery-1.js) files with me too via email, my email id is: animesh1831991@gmail.com. I don't believe it is possible to have a generic way to capture the fingerprint, even the webcam way described here using flash will no longer be valid in future. The other alternative is to have a standalone app that is installed on the client machine using webstart or wait for invention of a way using html5 or JS in the future. yes it's impossible to do it generically , but for a specific USB external camera , what's the approache to deal with it ? You may search for a flash plugin similar to the described one to do that. i am trying to make a project about online tutorial in which live streaming of both teacher and student is required. I need to access the client's webcam and microphone through jsp page and live stream my webcam through java. Can you please help in lieu of this? I think it is better to make it client application on both sides, the demonstrated way above using Flash technology which will be dropped in modern browsers. The main trouble i am having is to live stream webcam. The access of the webcam and streaming it. This is why you need to use client or browser plugin as modern platform like webex. Hi could you please send the following files in my mail. The previous email was invalid, resent again. Thank you sir for such a quick response.Received your mail.Code is working fine. can you please be kind enough to email me .js file and .swf files ? Sent many times, all return with failure notification.